Liverpool have appointed club legend Steven Gerrard as their Under-18's manager - with the new boss looking to encourage a more "physical" style. The ex-England captain replaces Neil Critchley, who will manage the U23s. 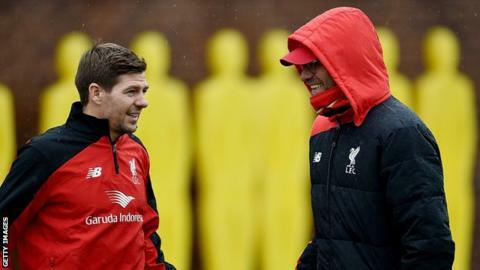 Gerrard hopes to curb the "show-boating mentality seen throughout academies". "A lot of kids think they have to do 10 lollipops or Cruyff turns to stand out. We all love a bit of skill and talent but the other side of the game is huge, it is massive" he added. Gerrard says too many young players try to emulate the "show-boating" style of Real Madrid's Cristiano Ronaldo. Gerrard - who made 710 appearances for Liverpool - says he likes streetwise players but says "too many try to model themselves on players like [Cristiano] Ronaldo". "You have to look at yourself and say, 'What are my strengths and how can I improve my weaknesses?"' he explained. Gerrard plans to help the "soft" youth players transition from the "comfort zone" of an academy to the professional ranks. "The kids in our academy are coming into an unbelievable place to work and there is a case where they get a little bit too much, too soon," he added. "It is a big shock for them when they move on or get released. "That's what you have to drive into the players: while you are here make the sacrifices and give it your best, don't get too comfortable because the hard work starts when you get out of the academy. "I've seen a lot of players who have come out of the academy with huge reputations and go into the Melwood dressing room and then it is sink-or-swim and a lot of them sink. "I have to help these players prepare for careers, not all with Liverpool's first team, but I feel if I can help them compete then it will help their careers depending on what level they get to." Gerrard returned to Liverpool as academy coach in February following his retirement from playing last year. "I have learnt a lot from the coaching staff here already," he said. "After speaking to Alex [Inglethorpe, Liverpool's academy director], we feel as though it is time to step up. "Neil has done a fantastic job with the U18s, so I hope I can continue where he left off, encouraging and nurturing players into the U23s and eventually the first team." Inglethorpe said: "Steven has brought invaluable experience and knowledge to us since joining the Academy, passing on some fantastic advice and guidance to our younger players. "We both feel now is the perfect time for him to take the next step in his coaching career and manage his own team." In his time as a player at Anfield, Gerrard scored 186 goals and helped the club win eight major trophies, including the 2005 Champions League final, when his goal inspired Liverpool's comeback against AC Milan. After leaving Anfield at the end of the 2014-15 season, he moved to LA Galaxy and scored five goals in 34 appearances during two seasons in America before retiring. He also made 114 England appearances, 38 as captain, putting him fourth in the country's all-time caps list.